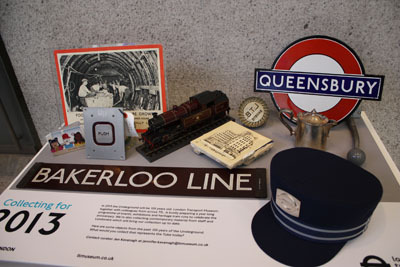 As part of the Collecting for 2013 project, I am keen to know what staff who currently work for London Underground think of our collections, and for them to offer their suggestions as to what we need to collect now. 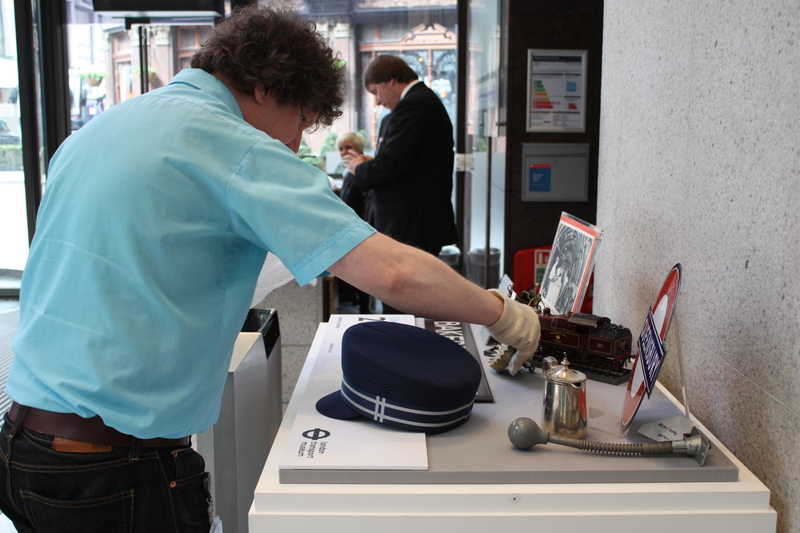 Last week, my colleague Simon and I took some Underground related objects to Windsor House, a Transport for London office, and installed a new display in their reception area. 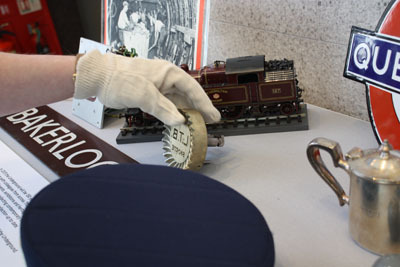 Objects include a modern Oyster card holder, an old tile from St James’s Park station, and a model of the first Metropolitan line trains. We’re asking staff to let us know what they think we should collect for this significant anniversary, and we hope these objects will offer some inspiration. Here are a few photos of us installing the display. 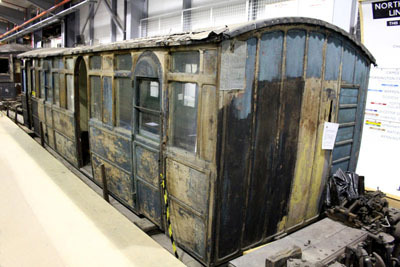 London Transport Museum has received a Stage 1 Development grant from the Heritage Lottery Fund (HLF) to support the preparation of a Museum bid to the HLF for the restoration of our Metropolitan Railway ‘Jubilee’ First class carriage No.353. We are also supporting Quainton’s own restoration project for their Met 1 locomotive. Please note that this is the full extent of information we have at the moment and therefore we’re currently unable to accept enquiries on this matter. Keep checking back for updates. Even though the artwork only arrived on Tuesday afternoon, our fantastic MTA’s (Museum Technician Assistants) wasted no time in starting work on the installation. They spent several hours on Wedensday drilling, hanging and sticking the art panels to the wall of our temporary exhibition space, where the artwork will be shown until the 3rd June. Today they have been working on the plasma screen, showing the films created as part of the project, which will be mounted onto the wall to complete the exhibition! Work has already begun on planning a celebration event, where the participants of each project will be invited to the Museum to view the exhibition and meet each other for the first time. Excitement in the office as the artwork for a small exhibition to celebrate the end of the Bus Shelter project arrives! Here’s a sneak preview of one of the panels, which should be going up in our temporary exhibition space by the end of the week! A New Subterranean Map of London – Get Involved! When thinking about London Underground, most people will relate to the tube system and their memories of events whilst on it, or to a crypt, basement or tunnel. This is all fine. London Transport Museum would like this blog to be a platform for expression in relation to subterranean places as well as history, archeology and comments. From your comments, I hope to find certain patterns or strands that reveal the histories of London’s people in relation to the geography of the place. When you think about what is underground in London, what do you see? What discoveries have you made both in fact and fiction? What rumors of ‘secret’ underground infrastructure have you heard about? What does the ‘underworld’ mean to you? Your idea of the ‘uncanny’? What are the stereotypes and impressions that you hold of certain areas? What is your concept of what is ‘underlying’? London is a palimpsest of a multitude of histories, what do you want to see on a subterranean map of London? London Transport Museum has commissioned me to create a new map for them. Our initial dialogue centered on ‘The Island’, a Map of London that I finished in 2008. Basically it was a hand-drawn map of London’s surface, where words and symbols mingled with geographical information to form among other things – a celebration of place. Traces of local history still resonating today were noted along with popular culture, contemporary life and autobiographical events. It was essentially a people’s map, a snap shot of a vast and complex city frozen in time. The information came from a vast range of sources – books, Internet, talking to people as well as my own experiences in the city of my birth and up bringing. I of course edited the details and epithets, but the filter that I used was a broad one in order for the piece to act as a mirror onto its viewer. The serious and the hard facts were to merge with the absurd and banal. It would defy conventions and act as a litmus paper to the reactions of its readers. A portion of my internet-based research came from Wikipedia. I was drawn to the ability of the medium as a direct and democratic arena in which anyone could contribute his or her story. What is fact and what is fiction and the residue left behind from both is in itself the very fabric of our culture and our folk laws. And so, this blog lends itself to that. I said afterwards, I would like to have noted the lost rivers of London in ‘The Island.’ The continuing flow of waters that now find themselves diverted and channeled through a system of pipes underground still ending in the Thames. These are the very routes of our city. When London Transport Museum came to me for a new idea, I thought of it straight away – An Underground map of London where I could finally include those lost rivers and develop my own tube map. I am currently developing the ideas for this subterranean map of London and entries to this blog may contribute to its development. The map will include the underground transport network, the lost rivers of London and other notable sites of interest from pre-history to the contemporary. However, I am also looking to delve a little deeper into the questions of what the ‘underground’ means and how it might be interpreted. Bus Shelters: What was it all about? Public transport in London provides millions of connections to millions of people every day. For some it is purely a means of travel; getting to work, school, an appointment or as a link to another mode of transport. For others public transport is a means by which they gain a sense of independence, social freedom or even offers them the possibility of exploration. Why do we journey, what journeys do we make and how do we make these journeys are all questions which I explored with young people during ‘Bus Shelters’; a youth engagement project, part of the national Cultural Olympiad programme Stories of the World. One of the most amazing outcomes of the project was to see the vastly different ways that each group of young people interpreted the same theme. Some groups explored their own physical and everyday journeys, looking at the ways they travel and the places and people they encounter along the way. Others undertook a more symbolic approach, seeing journeys as metaphor for their growth as young people, exploring the notion of the many and different pathways they must travel in order to reach adulthood. 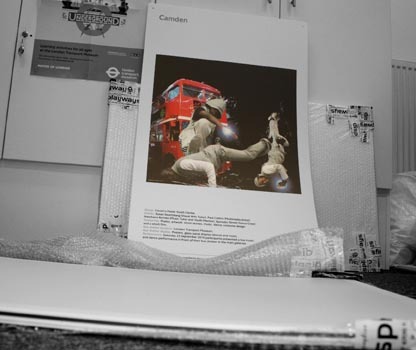 Working on the project has given me a great insight into London’s dynamic youth culture – and particularly, by virtue of representing being the London Transport Museum(! ), a unique and important glimpse into the way young people perceive travel and the journeys they make in what is arguably undoubtedly one of the greatest cities in the world! Whilst I am sad that the Bus Shelters project has come to an end I am excited about taking my experiences forward into a brand new programme of activities. Over the coming year I will be working with more young people to develop new methods and ways of working that incorporate their interests, opinions, insights and creativity into the museum’s everyday working practices. (If this was twitter and I could hash tag here I think it would be appropriate to say #toomuchfun). London Transport Museum has many different collections, from posters and signs to buses and trains, with so many other wonderful things in between. This week I was sent down to our drawings store at our Depot in Acton to do some research for an upcoming restoration project. I rather ashamedly had never entered the drawings store before (and can I confess I barely knew of its existence…) – it’s one of those sides to our collection that you only really explore when you really need to. Unlike our beautiful posters, which are often requested for books or exhibitions, or the vehicles which are so dominant in our stores, the drawings are kept neatly tucked away for safe-keeping, meaning I’ve never stumbled across them until now. A majority of the drawings are made on a linen-type material, which means they don’t rip or crease in the same way that paper does. They are also well used so are looking their age, but they are still of incredibly high value for understanding the vehicles in our collection, and London Transport stock as a whole. 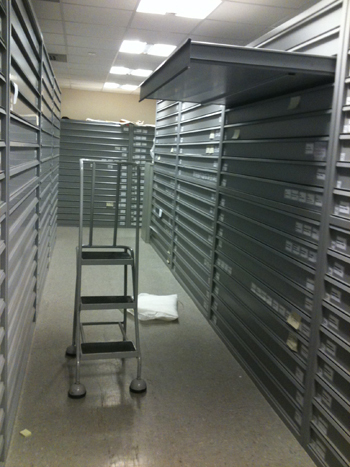 Getting the opportunity to delve into the drawers and search through the vast array of drawings was quite the experience, and a decent work-out – the large drawings weigh a tonne! Journeys 2012 is the working title for a major exhibition being organised for 2012. This exhibition will draw on the museum’s outstanding historic map collection to explore the theme of Journeys. The museum is commissioning a series of new artworks for the exhibition which will add further layers of meaning to the existing collection. One of the artists we are working closely with on this project is Stephen Walter. As part of Journeys 2012, the museum has commissioned Stephen Walter to produce a new map of London. By mapping what lies beneath the city, with reference to both fact and fiction, history and popular culture, Stephen’s subterranean map will present a new London “Underground”. The original artwork will feature in the museum exhibition in 2012, before becoming part of the permanent collection. Limited edition prints will be also published by TAG Fine Arts.